Luxury Waterfront House Rental in Kennebunkport. Families find tons of fun in the Kennebunkport Area. Besides a day at the beach, there are amusement parks just a short drive away. If you like Ferris Wheels, carousels, arcades and rides – then Palace Playland and Funtown Splashtown will make your vacation as wet and wild as you like. You can visit wild animals at the Zoo (York Wild Kingdom), or ride horses at a nearby stable. Mini golf is a family favorite during Maine’s summer and fall season, or if you prefer a par-3 course – Hillcrest Golf is right in town Kennebunk. Guided Tours of the Kennebunks - Intown Trolley - Board at the Nonantum or in Dock Square. Rockin’ Horse Stables - Horse Drawn Sleigh/Carriage/Wagon Rides! 245 Arundel Road, Kennebunkport, 967-4288. Maine Indoor Karting - High performance karting course. State of the art track, 1,200 feet long, 25 feet wide, nine corner design. An adrenaline charged experience. Scarborough, ME 885-0058. Funtown/Splashtown USA - Family amusement and waterpark. 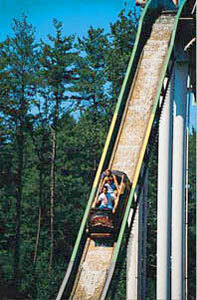 Home of Excalibur, Maine's only wooden roller coaster ranked one of the top ten in the world. Voted one of the cleanest parks in America and offers many rides, slides, pools, giftshops, games, arcades and eating facilities. Open weekends May and Sept. Daily starting early June. Free parking. Unlimited ride pass, slide pass or combination pass, group rates. Route 1, Saco, 284-5139.